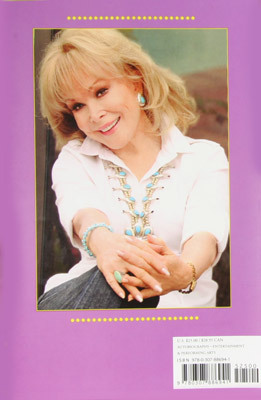 Acclaimed Actress Barbara Eden's Memoir featured on NY Times Bestseller List! "Jeannie Out of the Bottle," the new autobiography by acclaimed actress Barbara Eden, has just jumped to the New York Times Bestseller List! Everyone remembers "I Dream of Jeannie" so fondly and now this beautiful and talented actress tells the secrets behind the smiles, blinks and nods that were Jeannie's trademarks. Ms. Eden created a sensational Painted Pony for The Celebrity Collection titled "Dreamcatcher," that benefited breast cancer awareness and treatment. Barbara Eden was also profiled in an article in Horses in Art Magazine. Barbara Eden on spurning Hollywood heartthrobs and meeting Marilyn Monroe. For five seasons in the 1960s, Barbara Eden, starred as the titular heroine on the sitcom I Dream of Jeannie. Four decades and countless TV and film roles later, the Hollywood stalwart is still beloved for her magical, iconic role. Acclaimed actress Barbara Eden took center stage in the Celebrity Collection with her stunning Painted Pony titled "Dreamcatcher." Barbara Eden has been named one of "America's 200 Greatest Pop Culture Icons of the 20th Century" by People Magazine and one of TV Guide's "Most Popular Comedy Television Stars." Barbara starred as "Jeannie" in the classic 1960's television show "I Dream of Jeannie," which continues to be broadcast to adoring fans around the world. Barbara Eden's accomplishments have been honored with a "star" on the Hollywood Walk of Fame. She believes in the power of dreams and has created her Painted Pony to share the magic of dreamcatchers with her fans and collectors. Barbara Eden is a strong supporter of breast cancer awareness, research and treatment. 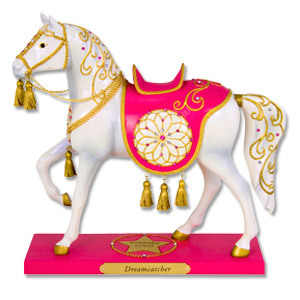 A portion of all proceeds from "Dreamcatcher" figurines were donated to support worthy breast cancer organizations.